Along with the MyPhone My96 DTV, the "multimedia company" also unveiled another device during the #MyPhoneTranscendence event, the MyPhone My95 DTV. The MyPhone My95 DTV, like its My96 brother, also comes with 5.5-inch HD display and powered by 1.3GHz quad core processor paired with 16GB of internal storage, however, the RAM is cut into half, from 2GB now it is only 1GB. The main camera is still 13 megapixel accompanied with dual LED flash, while the front facing one is now 5MP from 8MP found in the My96. The rest of the specs are the same with its sibling, dual SIM with 4G LTE connectivity, 2800mAh battery, Android Marshmallow and Full Seg DTV. 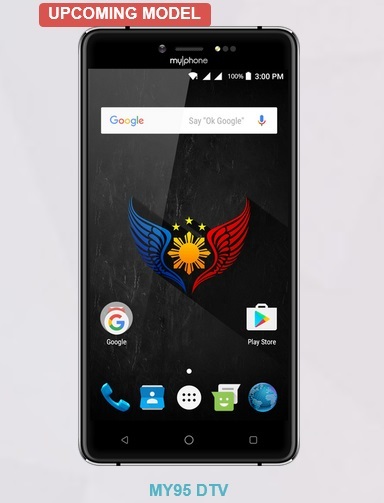 In terms of pricing, it is 700 pesos more affordable at Php4,299, the price difference translates to lower RAM size and lower MPs for the front camera, thankfully, the retail package still comes with a free screen protector and a phone case.